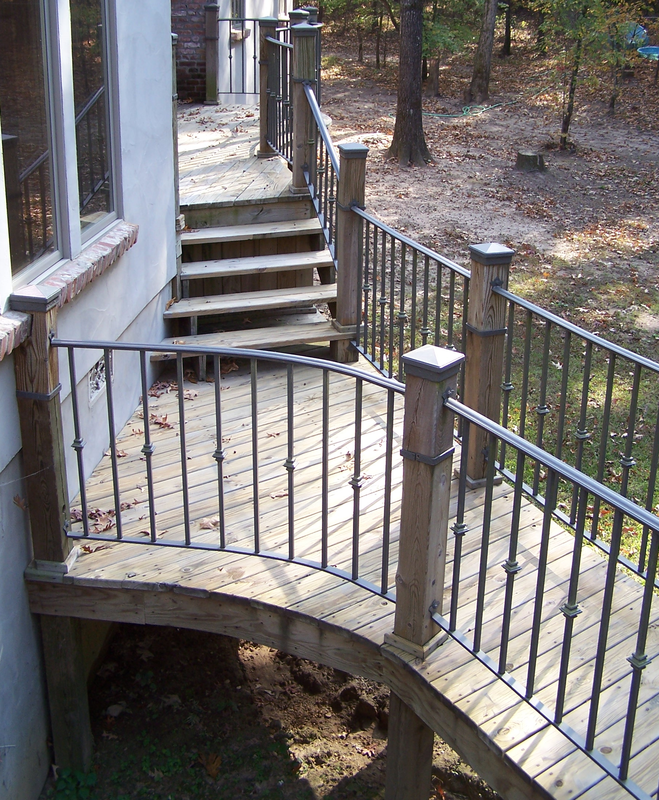 Our custom railings serve multiple purposes on dwellings of all kinds. From basic and simple to beautifully elaborate, they help you up and down stairs, keep your children safe on elevated surfaces, and enhance the look of your home, making your entrances more inviting. Since 2012, our railings have been powder coated in a wide range of colors for excellent durability. We will come to your home, discuss your needs, and measure the site. A detailed drawing is usually generated and sent, along with a turnkey price. The rails are usually installed within six to eight weeks. These were our first rails. The deck was built following curves drawn on the ground by the owner. We built our own machine to curve the rails, then cut them to fit between the 6 x 6 wood posts. It was like learning to swim by being thrown in the deep end! This is the largest house in Lincoln County, Arkansas. These rails were painted with acrylic urethane semi-gloss paint. It took seventeen iterations to get the formula right, but in the end the customer was pleased with the color. This is a stunning home built of rock and antique timber, with four levels. The owner of this dental clinic wanted to complement the decor of the building, an old house near downtown Monticello, Arkansas. These rails were powder coated a deep brown matching the doors of the clinic. This job was completed in July of 2013. This home has wrought iron handrails around three sides. Completed in January 2007, the rails are solid steel construction with acrylic urethane gloss white paint. Our client for this job gave these rails to his daughter and her husband for their new home. We completed the job just before her baby was born. The house owner had found a picture on the Internet of rails she wanted us to duplicate. She was very pleased with the result. We finished this job in February 2013. These photographs show our job for a dentist in Stuttgart, Arkansas. We built rails for the back of the house, and put a fence around his dog pen on the side of the house. These rails were painted gloss black in acrylic urethane. They were installed in December of 2005 with the help of my three sons. Following are a couple photographs of rails we did for a clinic in Warren, Arkansas. Finished in Dark Architectural Bronze acrylic urethane. Project was finished in July of 2013. These were built for clients in an older house in Monticello, Arkansas. They are finished in gloss black acrylic urethane. These are a few of the smaller rail jobs we've done, where the clients desired a bit of assistance for older visitors or relatives to get to the door.